Simple magic spells can be a perfect place to start if you are just getting started in your witchcraft practice (on that note, I do have another page of beginner spells too). 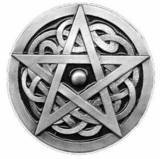 But quick and simple magic spells are an important part of any witch's collection, and can be very helpful in all aspects of your life. This is a very easy and simple protection spell to keep harm and negative energy out of your home. Then just leave the items in the ground to block out bad influences that might come to your home. If you need a little peace in your life, this quick spell will help smooth out a hectic time. Find someplace quiet to do this spell (even in the bathroom if necessary). Tie the feather to the end of the thread. Hold the other end of the thread between your thumb and forefinger, letting the feather dangle in front of your face. Once the feather is still, repeat the lines one more time and your simple spell is done.